A creative turkey burger destined to become a classic. In a medium bowl, combine turkey, Turkey and Mushroom Bases, celery, onion, cranberries, breadcrumbs, sage, parsley, pepper and egg, mix to combine. Divide meat mixture into 4 equal portions and shape each portion into a patty. In a large non-stick skillet, over medium heat add canola oil. Place patties in skillet; do not overcrowd, cook until done, about 20-25 minutes, turn occasionally. To ensure proper doneness, use an instant read thermometer. 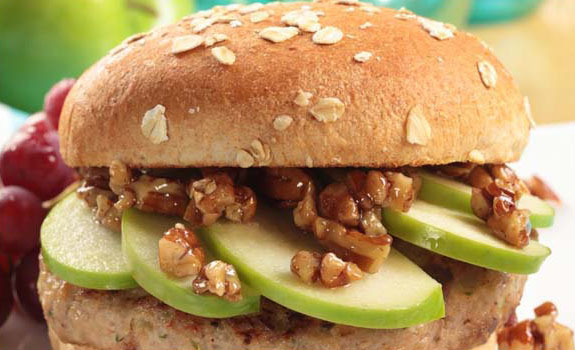 Place patties on buns, top with apple slices and glazed pecans. Lightly coat a small non-stick cookie sheet with oil cooking spray, set aside. Coat a small sauté pan with non-stick cooking spray; heat over medium-high heat. Add pecans and toast, about 2 minutes. Pour 2 tablespoons pure maple syrup over nuts and stir until maple syrup caramelizes, about 30 seconds. Spread glazed pecans on cookie sheet to cool, divide into 4 equal portions, set aside.